Last week I took my first rides after the cast removal, first on my mountain bike, then on my second road bike, which has MTB pedals (easier to clip out of, and my foot didn’t fit in my road shoe). With my ankle and lower leg lacking the full range of motion, pedaling was uncomfortable and I felt pathetic. Still, I managed to ride up a small hill, and it was good to once again experience the freedom of the open road, and to enjoy the colorful countryside and tranquil autumn atmosphere. 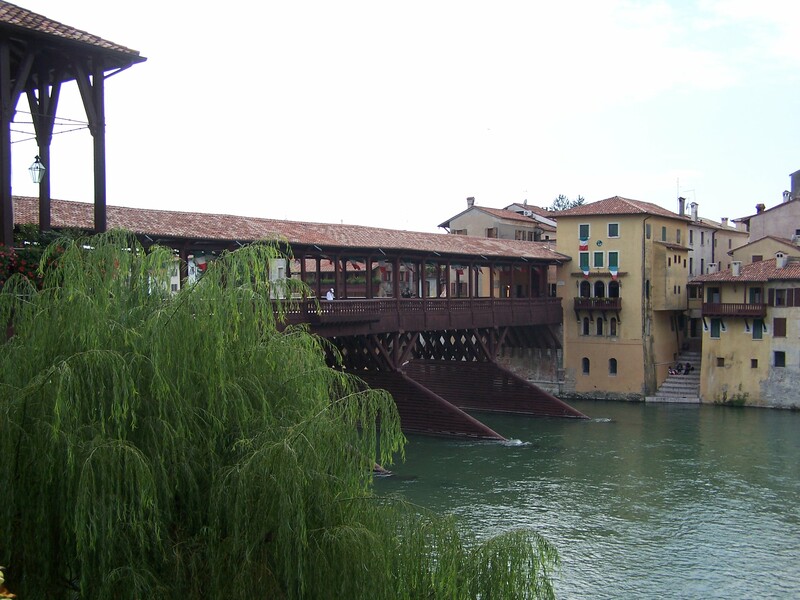 On Sunday there was a pro women’s race in Nove, near Bassano, known for its ceramics industry. Olympic bronze medalist Tatiana Guderzo, from nearby Marostica, would be competing, as well as former world champion and Tour winner Diana Ziliute, born in Lithuania, but considered a local after having lived so many years in this area. Being able to ride to this race has been my goal and incentive for the past few weeks. That morning I was pleased to find that my still-swollen foot fit in a road shoe, and that I could clip out of a Keo pedal. My pedaling action had improved too. The only thing I couldn’t do was climb standing up. After enjoying the pre-race atmosphere and seeing the start, I headed to Valle San Floriano, where the climb of the Rosina starts. The race would go over it three times. It’s named for a historic restaurant at the summit, founded by a local woman during the first World War, and now run by her grandson, a cycling enthusiast. 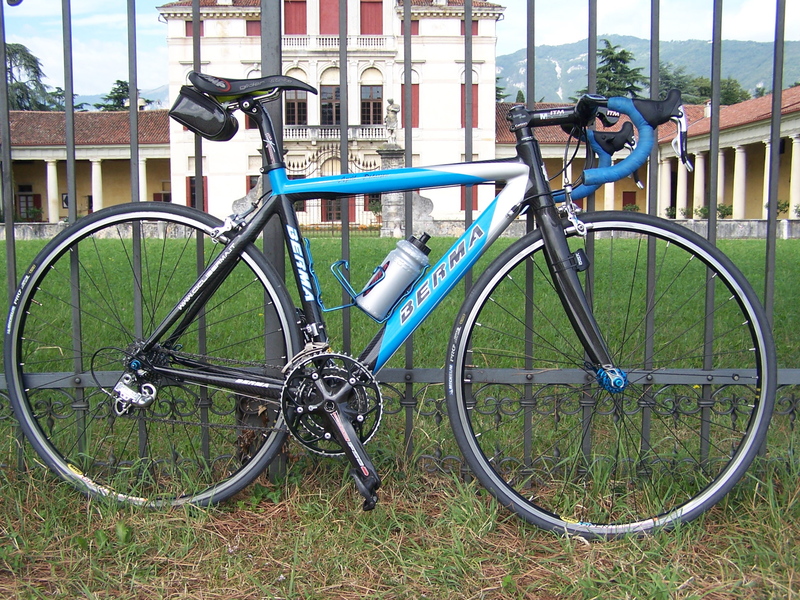 The Rosina circuit is on the course of many races, including many stages of the Giro d’Italia. I started up the hill, not knowing what to expect. Although I still couldn’t use my right leg efficiently, I made it to the top. It’s just a little climb, but it showed me that I hadn’t lost all my fitness, and that I was on the road to recovery. While waiting for the race caravan to arrive, I enjoyed the views of the lovely, fairy-tale hills and lower slopes of the Asiago Plateau. On Tuesday, armed with increased confidence, I rode to Bassano, making a detour to the velodrome, so I could snap a photo of the Madonna of cycling monument for the Testimonianze section of my site. 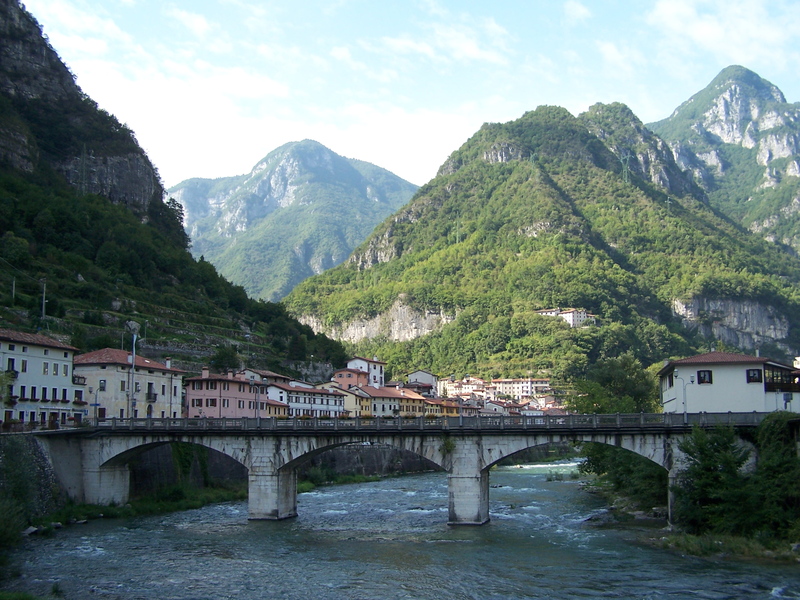 I rode across the beloved Alpini bridge, stopping to take in the beautiful view of the Brenta River valley, the Asiago Plateau, and the Monte Grappa massif. Then I headed up the river to Valstagna, one of my favorite towns, where I sat on the wall above the river and savored the architecture, the atmosphere, and the sights and sounds of the rushing water tumbling over boulders. I must admit that I’m enjoying this kind of riding: rambling, exploring, stopping to experience and photograph the beauty around me…things I always intend to do when I’m on more “serious” rides, but never seem to get around to doing. Having these temporary limitations, therefore, isn’t a such bad thing, as I’ve been compensated with a different kind of freedom.